Depending on the outcomes of the upcoming elections, it’s quite possible that many of us will find on Wednesday that some of our friends are Canadaphiles, or people who have an extreme fondness for (and in many cases, harbor empty threats to move to) Canada. Truth be told, there’s plenty to love about our great neighbor to the north, especially if you have an interest in malls and retail. Sure, they call Kmart “Zellers” (though they’re no longer the same company), and instead of TJMaxx, they have Winners. But in Canada, practically every major shopping center is enclosed (as a sweeping generalization!) and one of the largest malls in the world (The West Edmonton Mall) is up in the great white north. Downtown Toronto’s Eaton Centre is perhaps Canada’s second-most famous shopping mall. Located in the center of the city between Yonge, Queen, Dundas, and Bay Streets, the 330-store center is the most popular tourist attraction in Toronto, Canada’s largest city. The mall stands on the site of the original flagship Eaton’s store, which was once one of Canada’s premier department store chains. The mall itself, along with the modern 1,000,000 square-foot Eaton’s flagship store, opened in 1977, with a second phase following in 1979. 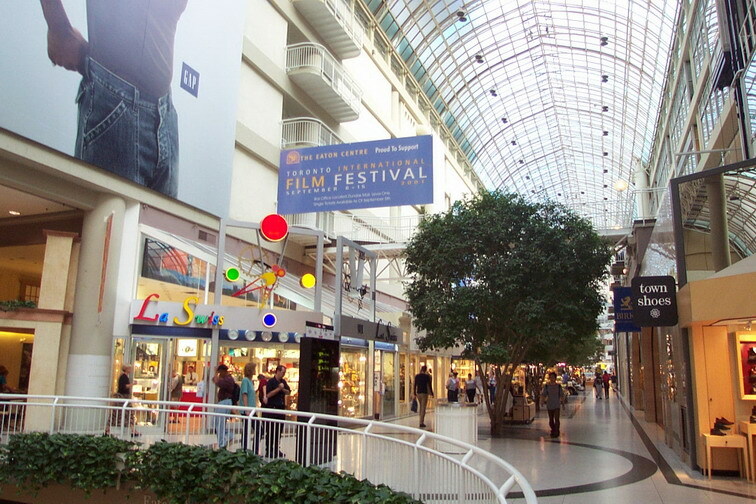 The mall immediately became one of the most successful in North America, and (as required by the city of Toronto), the mall’s interior remains open 24 hours a day since its construction userped several public streets. The mall’s greatest feature is perhaps its vaulted glass ceiling, which stands an astonishing 127 feet above the first level. It’s easily one of the tallest and grandest malls that I’ve seen, and its busy, active Yonge Street frontage (which is the closest that Canada has to a “Times Square” district) is a sight to behold at night. The mall today includes Sears (who purchased the bankrupt Eaton’s in 1999, and rebranded them 2001 or 2002ish), H&M, Canadian Tire, and Best Buy spread across 1,600,000 square feet. 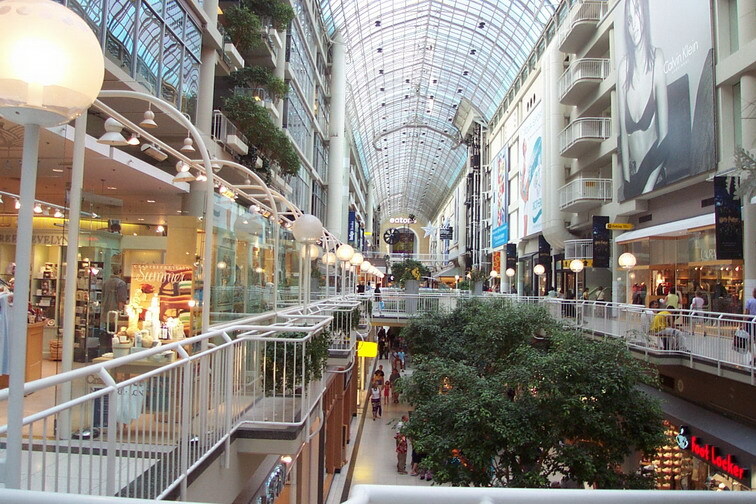 The Eaton Centre is also connected via skywalk to the nearby flagship of The Bay (or, in Quebec, La Baie), also known as The Hudson’s Bay Company, one of Canada’s largest remaining department store chains. All of these photos were taken by Prangeway in 2001. Note the presence of Eaton’s rather than Sears! Canadians can do malls! This one in particular looks very impressive; reminds me of the Worcester Common Outlets a little. woah, this mall has pulled out all the stops. Anyways, these malls are still called Eaton Centre, even though, sadly, there is no Eaton’s anymore. I remember shopping at Eatons with my grandmother at their location at Carrefour Angrignon in Montreal, and with my mom at Le Centre Eaton in downtown Montreal. I moved to Calgary in 1997 and don’t really remember much on Eatons here, except for when Sears tried to bail them out and they closed all their stores except for the one at the Eaton Centre downtown here and changed their logo. I visited Toronto last year for Caribana, and I wound up coming here a few times (to eat at the Food Court, people watching, etc. ), and I was very impressed with the mall. One thing I liked about the mall is how the subway stations are incorporated with the PATH system, which is incorporated into the mall. From what I remember, when you exit the subway station, one of the food courts (there are two food courts at the mall) is right at the subway station and the rest of the mall is right above you. The Sears is one of the nicest that I’ve been to, but that’s only because it used to be Eaton’s. Also, the Square across Yonge Street is known as Dundas Square. It’s no Time’s Square, but it’s getting there. The Canadian Tire and Best Buy are new additions to the mall and are loosely connected. They are the first of their stores in downtown Toronto. I was down there in late September when they both had just opened. The area around Dundas Square for the most part is still under construction. Dundas Square is Canada’s Times Square. The PATH system is quite unique and has a ton of stores in it. The picture of the Eatons in the photo was taken at the time when Sears had taken over Eatons, but tried to keep the name Eatons. A few years later Sears decided to scrap that idea and renamed any remaining Eatons stores Sears. Don’t tell me it’s *SAFE*, too! Those darn Canadians…always doing things right. Even the subway goes to the mall. This mall must have been used for the Schwartzenegger film, The Sixth Day…. just add animated birds. I used to always visit Eaton Centre whenever I went to Toronto. Do they still have the Canadian geese figures hanging from the ceiling? I don’t see them in your photos. How many Canadian malls are named Eaton Centre? I went to another one in Vancouver. It was more like a conventional suburban regional shopping mall, whereas the Toronto version definitely reflects its urban environment. The geese are still there, a couple years ago the mall wanted to add red ribbons to their necks for Christmas, but the artist who designed the whole geese flying scene threatened to sue so it was never done. I believe every major city had an Eatons Centre at one point, like Vancouver, Calgary, Edmonton, Toronto and Montreal. 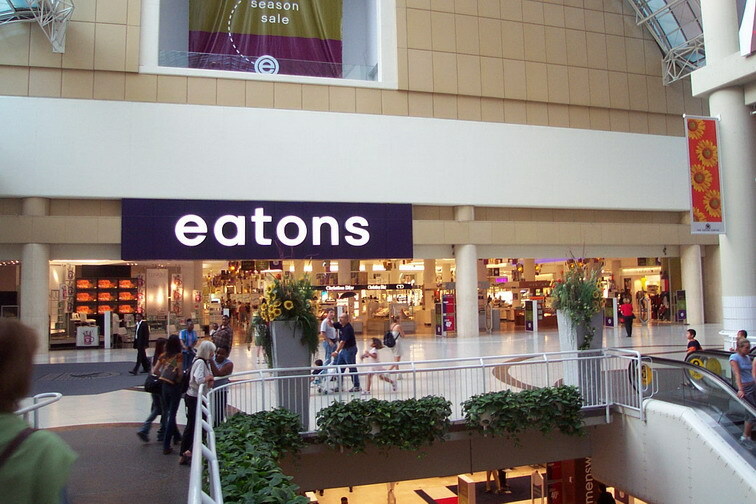 In Ontario at least, Eatons entered into “Eaton Centre” or downtown mall projects across the province in the late 70s-80s to bring shopping back to city cores. Many of these malls wound up as failures, especially after Eatons ran into financial trouble. Among the current uses for these sites: a minor hockey arena (Guelph), a newspaper office (Market Square in Kitchener), Liquidation World (Hamilton). Geesh, that ceiling and the immense size of that place makes it look like a Canadian version of the Houston Galleria on steroids! I’ve heard about the West Edmonton Mall, but never that one for some reason. West Edmonton Mall is overrated in my opinion (sorry Edmontonians). Sure its big and all and has all these extra features (hockey-rink, waterpark etc), but some parts of the mall are in dire need of renovations and being fixed up. The newer phases of the mall are not bad, and most of the stores have renovated themselves, its just the infrastructure and halls and the mall itself that needs fixing up. Some of it is quite out dated and dirty, I ate in one of the food courts and was disgusted at the condition of the tables and sitting area. Kmart is related to Kresge in Canada and Zellers is the discount arm of The Bay, formerly Hudson’s Bay Company. It was however the site of what was feared to become Toronto’s greatest modern fire in the 70’s during demolition of the Eaton’s Edwardian era complex. The mall is 24/7? I have to go! Are any of the stores open 24/7 or very late? The last time I went to Toronto, I visited Eaton Centre (which is actually Toronto’s top tourist attraction) and was very impressed. Back then, they had a merchandise theme in that the higher the levels, the higher the prices (the 3rd level consisted of the most exclusive stores). The mall also had cool fountains…one in the center that was always changing and another two on the Eaton’s end. The one closest to Eaton’s had glass globes, somewhat similar to one of the fountains at the Mall at Short Hills, and the other was a waterfall between the escalators leading to the basement levels. The Gap was also in this mall at that time. The underground city (PATH) of Toronto is also quite impressive both in architecture and size. It is a good thing you said you were an Eaton’s Expert and not Hbc Expert. Some errors in your blog caused me concern. The Hudson’s Bay Company (Hbc) (est. 1670) is Canada’s oldest corporation. Hbc owns stores across Canada under the banner names The Bay, Home Outfitters, Fields, & Designer Depot. Zellers is a wholly owned subsidiary of Hbc. Hbc purchased K-mart in 1998 and changed them mostly into Zellers stores. Zellers head office moved to Brampton, Ontario into K-mart’s former head office building. The Bay building across the road from the Toronto Eaton Centre used to be Simpson’s (The Robert Simpson Company Limited) , When Hbc bought the company the Simpson name was used until 1991. The flagship store in Downtown Toronto (across from the Eaton Centre) was the last store operating under Simpson’s. in 1991 that store’s name changed to The Bay. The attached tower at the time of this post is still called The Simpson Tower. According to different reports NRDC is not renaming the Bay stores. The Bay stores across Canada might be reduced to fix Lord and Taylor in key markets.Also NRDC will put in Fortunoff areas inside Hudson’s Bay Company stores. Zellers ( similar to Target) might have more upscale items. I think this will be good for Canada ,Hudson’s Bay Company and NRDC. I spend thousands of dollars in clothes at the Bay Store on Bay Street, Toronto each year. I have been to the store several times of the past weeks and am very disappointed in the poor quality and style of clothes for plus sizes this year. Until now I have always found several items to choose from. I do not know who is doing your buying this year, but they should keep in mind that those who wear plus sizes also have a sense of style and look for quality. I am extremely disappointed and would like to speak to the person responsible for purchasing. NRDC Equity Partners surprised the industry in 2006 when it bought Lord & Taylor and engineered one of the most striking retail turnarounds in U.S. history. Now the New York City–based private equity firm has trained its sights north of the U.S. border and onto a loftier goal: revolutionizing Canada’s tired department store sector. NRDC, a relative newcomer to the department store scene, gained control of Canada’s oldest department store chain, The Bay, in July when it purchased Toronto-based retail conglomerate Hudson’s Bay Co., in which it held a minority stake. The firm has since embarked on a plan to revitalize the Bay and to export Lord & Taylor to Canada. The plan hinges on providing better brands and service at the Bay and reconfiguring the vast real estate portfolio of Hudson’s Bay Co., which will, among other things, make way for Lord & Taylor. Canada has only two national, full-line department stores — the Bay, with 94 stores, and Sears Canada, with 123 — plus a handful of smaller department store chains. Among the better are successful, fashion-focused players Holt Renfrew, a luxury chain with nine stores in major cities, and La Maison Simons, a more moderately priced chain of seven stores in the province of Québec. Canada’s department store sector is a shadow of its former self, owing to the consolidation that began in the late 1980s and lasted until the mid-1990s, knocking out Eaton’s, once the country’s largest department store chain, and many others. Sears Canada (Hoffman Estates, Ill.–based Sears Holdings Corp. is majority owner) purchased the assets of bankrupt Eaton’s in 1999 in an ill-fated attempt to relaunch the chain as a higher-end brand. Ultimately, former Eaton’s stores were closed, sold to the Bay or converted to Sears units, including some in downtowns that observers say have proved challenging for the quintessential suburban retailer. The country’s small pool of remaining department store chains has created sameness in many markets, a problem exacerbated by aging stores and competition from foreign big-box and specialty retailers that have flocked to Canada in recent years. Strong consumer activity has drawn foreign chains, although retail sales have softened a bit. Nonautomotive retail sales, including food and beverage store sales, hit C$270 billion ($257 billion) last year, up nearly 30 percent from 2002, or just over 5 percent on a compounded annual basis, according to J.C. Williams Group, a retail consultant firm. (The firm calculated this growth rate using unadjusted sales figures from Statistics Canada.) Yet, with the exception of high-end players like Holt Renfrew, department stores have generally failed to reap the benefits of robust consumer spending, experts say. Instead they have lost market share to competitors. Wal-Mart has taken the country by storm since it arrived in 1994. In recent years the discounter has begun rolling out Supercenters there. For the five-year period beginning 2000, the Bay’s sales declined by just over 1 percent on a compounded annual basis, to C$2.6 billion. The Bay’s parent company was public until early 2006, when South Carolina businessman Jerry Zucker acquired and privatized it. Zucker set himself to turning around the retail behemoth, which also owns the 280-store Zellers mass merchandise chain, but the improvements were largely internal, focusing on such areas as information technology, observers say. After Zucker’s death in April, NRDC acquired the company and formed Hudson’s Bay Trading Co., a holding company for Lord &Taylor, Hudson’s Bay Co., Fortunoff and the fledgling Creative Design Studios. The latter develops fashion products under the Black/Brown 1826, Context, Kate Hill and Peter Som labels. It remains to be seen whether Canadian consumers will warm to Lord & Taylor, but NRDC does appear to be off to a good start. The firm declined to comment for this story, but it has announced that it will invest $500 million into Hudson’s Bay Trading, signaling that a quick exit is not among its intentions. “They have shown they are willing to pour a ton of money into their properties to bring them into the 21st century and create an appealing shopping experience, which is what is going to differentiate the Bay from its competition,” said Kelly Tackett, a senior consultant at TNS Retail Forward, in Columbus, Ohio. The Hudson’s Bay acquisition gives NRDC a stable of trophy retail properties, including many stores with mature, low-rent leases, in major markets from coast to coast. The firm has said it will open 10 to 15 Lord & Taylor stores throughout Canada, converting some Bay stores and possibly carving out space for Lord & Taylor in some of the Bay’s cavernous flagship stores. It also plans to open Fortunoff jewelry and home-furnishings departments inside Bay stores, which some experts compare to Macy’s in the U.S.
NRDC “sees a lot of room to operate between Bay price points and Holt Renfrew because there is nothing in between,” according to Alan Marcovitz, president and chairman of the Montréal-based Westcliff Group of Cos., one of Canada’s largest privately held real estate firms. “There is a big field for the taking,” Marcovitz said. NRDC wasted no time hiring a team of high-powered fashion and retail veterans to figure out how to do that. In July it named Jeffrey Sherman, who has held top positions at Bloomingdale’s, The Limited and Polo Ralph Lauren, chief executive of Hudson’s Bay Co. It has also hired fashion expert Bonnie Brooks, who was most recently president of Hong Kong’s Lane Crawford Joyce Group, a leading international brand group in Asia, to head the Bay. Brooks’ career also includes stints at Holt Renfrew and Flare, a leading Canadian fashion magazine. For mall owners, NRDC’s plans are tantalizing. Of course, they are eager to see the Bay and Zellers re-energized, but the impending arrival of Lord & Taylor will give some an opportunity to differentiate their properties. Landlords may also want to reclaim some department store space to accommodate additional specialty retailers, should the Bay decide to downsize certain stores to improve performance. A reinvigorated department store sector may also spur the development of new malls outside downtown areas, where there is more room for growth than in urban markets. To be sure, plenty of horse trading will go on between Hudson’s Bay Trading and landlords as the company seeks to reconfigure its portfolio, which also contains 61 Home Outfitters and 161 Fields stores. “The whole problem [for Canada’s mall owners] was they had nothing new to offer in terms of anchors,” said Harley Oberfeld, president and CEO of tenant advisory firm Oberfeld Snowcap, which has offices in Montréal and Toronto. “How many Bay-Sears malls can you build?” Canada has not seen the ground-up development of a traditional regional mall since 1990, Oberfeld says. With a small and slowly growing population of slightly over 33 million, Canada is unlikely to see large numbers of new malls built anytime soon. Yet some observers say U.S. department store chains that have been on the sidelines may be motivated to enter Canada if Lord & Taylor succeeds there. And they doubt that name recognition will be a critical factor in determining its fate. @SEAN, As a reply to that article, I wouldn’t be surprised if NRDC’s purchase of HBC had more than one motive in mind. The May-Federated merger necessitated the closing of an anchor store in nearly every mall in the United States as the various nameplates associated with both companies (Strawbridge’s, Marshall Field’s, Filene’s, Hecht’s, Lazarus, Kaufman’s, and so on) were condensed into the Macy’s nameplate, and as most malls had a May anchor and a Federated one, this also meant that most malls in the country lost an anchor. Hence, there are a lot of empty anchor stores lying around. NRDC’s ownership of HBC not only gives it room to introduce Lord & Taylor to Canada, but also to bring the Bay chain down into the U.S., where it can immediately set up shop in the many vacant mall anchors and compete directly against Macy’s in the niche the May stores once held. The question I wanted to ask has to do with the history of the Eaton Centre in Toronto: has it always been Toronto’s #1 premier shopping and tourism destination? I’ve heard rumors to the effect that it was beginning to run down roughly around the time that Eaton’s went bankrupt and that mall renovations helped bring it back. Since I’m working on a project to assess an urban shopping district where there’s a mall that could be a physical asset–but its current condition renders it a severe detriment–an answer to this question would be much appreciated. Thanks! The main part of the Centre is just now getting a facelift–there is scaffolding throughout the mall right now and they are completely redoing the food courts (the north one first). There were significant changes not long after Sears went in to redo what had been the bottom floor of Eaton’s into regular retail–that’s when the Old Navy and the H&M went in.. Ryerson University built their Ted Rogers School of Management where the old parking garage used to be (adding new parking at that time) and Canadian Tire and Best Buy were added and joined up with the mall on the north side. The big new addition (just last week) is Victoria’s Secret. Empty storefronts are rare in the main part of the mall, large chain stores dominate, and it’s still true that the high-end stores are on the top level. Less than three years after Richard Baker bought a struggling Hudson’s Bay Co. from the widow of its former owner, the New York investor is set to pocket close to $2-billion in a deal that accelerates Target Corp.’s entry into Canada. HBC sold the bulk of its weakest chain, Zellers Inc., to the U.S. retail giant. Target will assume control of up to 220 Zellers stores and said it will spend more than $1-billion to convert 100 to 150 of them to its own banner within the next two to three years. The move, which comes after years of rumours and discussion about Target’s desire to acquire space in Canada, will dramatically reshape the domestic retail landscape. It underscores the growing demand by foreign retailers for Canadian locations to take advantage of the country’s relatively healthy economy. It also opens the door to other U.S. chains, such as Kohl’s Corp., which are believed to be interested in Canadian expansion and are now expected to examine some of the Zellers locations that Target doesn’t want. Mr. Baker owes much of his windfall to a vibrant Canadian retail sector and brisk consumer spending activity. According to sources, the interest from popular U.S. chains is so great that when word leaked out last fall that Mr. Baker’s private equity fund NRDC Equity Partners might consider a sale of Zellers, a number of U.S. players expressed interest. The most ardent suitor was Target Corp., which had quietly been eyeing a Canadian perch for a decade. The popular retail chain has never operated outside the United States, but sources familiar with the discussions said Target pushed its search into high gear in November by entering talks with Mr. Baker when it learned that competitors were also stalking Zellers. “They didn’t want to get beat out by other parties,” Mr. Baker said in an interview Thursday. Zellers, which has struggled since the mid-1990s, entered what could be its last chapter in its 70-year history last week in Target’s headquarters in Minneapolis, Minn., where Mr. Baker travelled to negotiate an agreement. The deal relieves Hudson’s Bay of the burden of a tired retail chain that was losing ground to bigger U.S. competitors, particularly discount giant Wal-Mart Stores Inc. The deal ultimately was done in about 30 days, Mr. Baker said, opening the way for the cheap-chic U.S. discounter, often referred to as Tar-zhay by the style-savvy, to launch its first outlets in Canada by 2013. The sale is a financial coup for Mr. Baker. He acquired HBC in 2008 for roughly $1.1-billion; now he’s set to collect more than $1.8-billion in the agreement, plus “hundreds of millions of dollars” for an estimated $800-million worth of Zellers inventory that will be divested, sources said. In addition, Mr. Baker is sitting on more than $1-billion worth of real estate that HBC owns, including its downtown Toronto flagship Bay store and the connecting office tower. The deal provides Target with 240 days to select the Zellers stores it wants to occupy. The company expects to eventually have more than 200 outlets in Canada over the next decade, said Gregg Steinhafel, chairman and chief executive officer of Target. Nevertheless, Target still faces some hurdles in its Zellers deal. It has to negotiate terms of each lease with an array of Canadian mall owners. “We have a lot of work ahead of us, property by property,” Mr. Steinhafel acknowledged. However, landlords generally are keen about getting Target – or another new retailer – into its sites. RioCan Real Estate Investment Trust, the largest Zellers landlord, hasn’t ruled out allowing current leases to stand – at $6 a square foot they are all below the market average of $14, said CEO Edward Sonshine. But he said he’s not willing to rubber stamp the deal without more research. Meanwhile, Target may have a fight on its hands. Toronto fashion merchant Isaac Benitah has owned the rights to the Target name in Canada for almost a decade but now the U.S. discounter has challenged his right to use the name before federal trademark authorities. Mr. Benitah is pressing on with plans to expand his Target Apparel chain by adding at least a dozen of the superstores in the next couple of years, a source has said. Mr. Baker said he’ll use the proceeds of the Zellers sale to reduce debt and invest $500-million over the next three to four years in his other chains, including the Bay and U.S. department store retailer Lord & Taylor. Later this year, he plans to take the company public. This has the world’s largest Sears, right? Even if they do downscale a bit, they still have far more than even the downtown flagships in America at their peak. Do people live at the mall, is that why I saw balconies? @jhshifris, Actually that’s office space. ACCORDING TO YAHOO! THERE WAS A SHOOTING IN TORONTO’S EATON CENTER, TODAY 6-2-12, ONE DEAD, 7 INJURED INCLUDING A PREGNANT WOMAN WHO’S GONE INTO LABOR AND A 13 YEAR OLD KID, PRAY THE VICTIMS OF THIS HORRIBLE SHOOTING ARE ARE OKAY!!!! @Nordrike Field, I hope so as well. Gun violence is far less prevalent in Canada as compared to the US. On a better note, I just found an article on Toronto area food courts. Urban Eatery one of Toronto’s Best Food Courts! Food courts in Toronto have had a bit of a resurgence of late. From re-modeled downtown food courts like the Urban Eatery to street vendor style set-ups like 214 Augusta Avenue, there’s even more reason these days to be excited about your favourite lunch options all being in one place. The best food courts in Toronto distinguish themselves from the cookie-cutter mall variety with more interesting options than just a collection of Subways, Manchu Woks or McDonalds. Not home to your typical fast food chains, these Toronto food courts provide proof that eating with a crowd of people in a communal space is actually something to look forward to. Here’s a list of the best food courts in Toronto. The undisputed king of Asian malls in the GTA, this shopping goliath in Markham actually features two separate food courts: the rather cramped older one, which offers many Cantonese dishes and even some dim sum delicacies, and the newer one ironically designed with an old-town China feel. Inside it offers a wide range of regional specialties such as Japanese cream puffs from Beard Papa’s, Yummie’s Hong Kong style egg waffles, bento boxes from Japanese Express, bubble tea, dumplings and fresh hand made noodles at Sun’s Kitchen. This is the only food court on this list that has its own name – and for good reason. Newly redecorated and revamped, this Eaton Centre food court is a stellar example of the ultra-modern food court experience. With real cutlery, reusable dishes, Danish-designed furniture and the presence of lots of popular, small local-chains (Urban Herbivore, Big Smoke Burger, Amaya), this is a place that makes braving the check-out lines at H&M worth it. Not your typical restaurant-chain-laden food court, the lower level of St. Lawrence market is awash with numerous independent merchants all eager to serve up a sampling of freshly prepared food. Best of the bunch are freshly made crepes from Crepe it Up, potato latkes and other Eastern-European delicacies fromEuropean Delight, massive sandwiches from Mustachio and raw food at Cruda Cafe. Located directly across the street from OCAD and the AGO, this always bustling food court is home to a wide variety of eats that are easy on the wallet. At the top of my list is Manpuku, a self-described modern Japanese eatery, that serves up fresh takoyaki, five types of udon soup and Japanese curry. Also noteworthy are Karine’sfor all day breakfast and other healthy eats, Mission burrito, Pita Village and Helena’s Magic Kitchen. While the traditional definition of a food court places it in a mall or some larger complex, the burgeoning food destination at 214 Augusta is quickly becoming an unavoidable Kensington Market pit stop. Mexican and South American street food rules the day here at vendors like Agave y Aguacate and Rebozos but not to be bypassed are Portuguese salt cod fritters at Avo and Macondo’s Colombian empanadas. Seating is almost non-existent save for a makeshift back patio during warmer months. Located within the bowels of one of Markham’s busiest Chinese malls, this food court offers a wide variety of Asian food offerings. There are numerous bubble tea shops, decent noodles at Malay Thai, large bowls of soup at Pho Ling’s and delicious Korean BBQ. The fact that Chinese seniors often use the open spot right in the middle of the food court to practice tai chi practically guarantees you free morningtime entertainment. This small food court near Steeles and the 404 offers a small but diverse array of Asian food. Try the tasty Taiwanese pork chops (courtesy of Chin Yuan Pai Ku), sushi and bento boxes at Spicy Korea or cheap combo deals at New Fountain. Bonus points for the recent renovation although it’s still no Urban Eatery. Arguably the most corporate food court to make this list, TD Centre (conveniently located within the PATH Network) manages to rise above the myriad of quick service destinations in the Financial District. Long time lunchers here will recall this as the first location of the now international Freshii (formerly Lettuce Eatery) chain. There are around 20 restaurant options, modern seating and decor (to pair well with that new suit) and a steady line-up for burritos courtesy of Freshwest Grill. Tucked away at the back of the Downsview Merchant’s Market, this sprawling food court is comprised solely of independent retailers eager to feed hungry shoppers with a smorgasbord of international cuisine. Where else can you eat Lebanese, French, Chinese and Caribbean food by just moving 6 feet to your right (or left)? Wash everything down with a sour sop with pineapple juice at Juicy Hut, the popular local juice stand. This obscure spot near Finch and Weston Road is the very definition of a hidden gem. The main attraction at an otherwise ramshackle Latino mall, this food court is teaming with tasty eats from Colombia, Chile, Ecuador and beyond. Pair regional specialties such as empanadas, pupusas and tacos with an Inca Kola but save some room for some churros for dessert. I’m sure our canadian readers have some interesting opinions on this topic, so bring them on! @SEAN, It’s a very interesting report about the food courts; our local food court only has Villa Pizza, Panda Express, Carl’s Jr., Mrs. Fields, Hot Dog on a Stick, Charlie’s Grill Subs and a Suki Hana, those food courts from our neighbors from the Great White North makes ours look to shame, some of those choices really look delicious! But it’s really sad about the shooting; I work at the mall’s Macy’s and that’s always that worried me; from the Tacoma Mall shooting to Westroads but Temecula is a safe town but our mall had a crime in 2009, a woman was stabbed and killed by her husband on the East Tower parking lot by the cinemas, it was the first murder of the year and the first one on the mall’s history, we do get some shoplifters but nothing serious and I pray every day that it stays like that; as for the Canadian shooter I just hope they catch this freak! @Nordrike Field, I agree with you on the “American” style food court, most of the options are the same in nearly every mall in the US & even Canada. High fat & low nutrission is what you will normally find, but there are a few standouts on this side of the border as well. Most notable are a handful of Los Angeles area Westfield properties including Century City. The company is testing fresh food options by local restaurant opperators rather than chains to find out if this concept could work nationwide. Part of this tryout involves the substitution of plastic trays & utencils for plates & silverwhere. It may sound like a novel concept, but the truth is it shouldn’t. The above article shows what could be acomplished if a little more thaught & creativity went into the food court space. @Nordrike Field, The Next Wave of Food Courts? Chinese food-court innovation could signal coming change in the U.S.
Food courts in China today offer a range of experiences, from the simple stands one might see in the U.S. to high-end, luxurious food spots. Experts say China is not simply one contiguous market where food-court restaurants can be plugged in uniformly across the board, but a collection of different markets with varying levels of commercial development and, therefore, tastes. The variety and move toward more upscale food courts, many believe, could give U.S. restaurants a glimpse of things to come state-side. After all, these restaurants, which come in both quick- and full-service formats, are often the primary draw for Chinese shopping malls. Meanwhile, in the U.S., just 7 percent of U.S. shoppers specifically seek out the food court at a mall, says David Foster, a food consultant with Foster and Associates, citing a study by the International Council of Shopping Centers (ICSC). Retailers desperate to regain their footing after the recession, therefore, would be wise to take note of Chinese food courts. But these watering (and feeding) holes are a far different beast than typical U.S. food courts. Chinese food courts range in size, but are typically 15–20 percent larger than those in other major Asian markets, including Thailand, Singapore, and Malaysia. Shanghai’s newly opened food court Réel Kitchen houses 11 full-service restaurants, along with 24 quick-service eateries and 11 snack stalls, and boasts more than 66,700 square feet of dining space that seats 1,000. One location of Food Republic, a Singapore-based company and largest food-court operator in China, can attract 3,000–4,000 diners per day. In the U.S., just 7 percent of U.S. shoppers specifically seek out the food court at a mall.American shopping-mall food courts are generally around 15,000 square feet and have about 15 eateries, Foster says. How do Chinese food courts pull it off? The answer may be in the huge culinary variety offered at the many shops within each court. Korean, Japanese, Taiwanese, Singaporean, Vietnamese, and, of course, Chinese restaurants dot food courts across China. Along with the ubiquitous spicy, stir-fried dishes that many Americans associate with China, passersby might also find a restaurant that serves hot pot, a popular soup-based meal similar to fondue in which eaters cook meats, vegetables, and noodles in a large pot of boiling soup, then dip into sauces that can be customized from a variety of ingredients, including soy sauce, sesame paste, chilies, garlic, and scallion. Another popular food-court offering in China is dumplings, which come in several varieties: pan-fried like potstickers, for example, or boiled like wontons. They can be shaped into small rounds or larger half-moons, and filled with meat, a combination of meat and hot soup, chopped green vegetables, or seafood. There are also plenty of curry houses in Chinese food courts, as well as quirky concepts like Toast Box, a chain restaurant dedicated to thickly sliced toast spread with butter or peanut butter. Not all Chinese food-court restaurants are in the business of serving full meals. Snacks, sweet drinks, baked goods like breads and pastries, chocolates, and dessert items are also popular offerings. Specialty drinks are particularly in demand, with long lines of customers waiting for sweet tea, juice, or milk-based drinks that can be customized by adding fruits, chewy tapioca “pearls,” chocolate, coffee, or even small beans commonly found in Asian desserts. In China, Asia-based food-court operators have especially seen success. Food Republic, for example, has been operating in China for 15 years, says divisional CEO Jenson Ong, and other successful food-court operators hail from nearby Hong Kong and Japan. Offering a wider variety of foods, Ong says, and larger portions than those in other Asian markets gives Chinese food-court locations a unique attraction. But serving small, hand-held snacks that allow eaters to nibble from one stall to another has been a recent trend, echoing the street-food experience commonly found across Asia in open-air marketplaces. Typically, street food refers to snack-like items such as chicken wings, fish, or meatballs on skewers; fried tofu; or smaller portions of one-dish meals, such as noodle soups served from small kiosks. Réel Kitchen, meanwhile, features snack food and drink kiosks organized into rows and separated from the main dining area, giving it a marketplace feel. .RioCan, which has made substantial bets on the U.S. with an equity investment of $555-million over the last three years in 48 shopping centres comprising 13 million square feet of retail space, says it’s still primarily a Canadian play. The REIT says 86% of its assets are in Canada and the growth in this country is focused on urban centres, especially in the GTA. Ed Sonshine, chief executive of RioCan, takes questions at the company’s general meeting in Toronto in 2009. .Ed Strapagiel, executive vice-president with KubasPrimedia, says the population in downtown locations will continue to drive demand for retail developments. “These people down there still need everyday stuff for their houses like paper towels,” says Mr. Strapagiel. This was in Eliot Lake ON. Retailer seeks 200 stores within a decade — more than half of them in the next couple of years.
. Target Corp. said Thursday that it’s on track to open at least 125 Canadian stores in a rapid expansion taking less than two years. The retailer has called the coast-to-coast northern expansion crucial to its goal of reaching $100 billion in sales in the next seven years, up from $69.9 billion in fiscal year 2012. The first 24 stores will open next March and April, with more openings throughout the year, the company said. Additional stores, with locations to be announced later, will follow in 2014, Target said. Target spokeswoman Lisa Gibson said the retailer will invest $3.5 billion in Canada, where it aims to open 200 stores within 10 years. “They’re really doubling down in the importance of this market,” said Dave Brennan, co-director of the Institute for Retailing Excellence at the University of St. Thomas. Target needs to carve out long-term opportunities for growth, Brennan said, and the Canadian market is a great testing ground for the retailer’s global expansion strategy. Most of Canada’s population and its major urban centers are concentrated within 100 miles of the U.S. border, Brennan said, making logistics much easier than in Mexico, where the population is more dispersed. And while there are some differences in culture and in law — all labels in Target stores will have to be in English and French — Brennan expects stores in Canada to be similar to those in the United States. As part of the deal, however, Target will be required to carry uniquely Canadian cultural products and support Canadian cultural events and organizations, according to the Office of the Minister of Canadian Heritage and Official Languages. In preparation for Target’s arrival, Wal-Mart, which has 333 stores in Canada, is cutting prices and investing in its own expansion efforts. In February, the company announced it would spend $573 million in Canada, adding 42 stores. Wal-Mart Canada is by far the largest discount retailer in the country, Brennan said, and within a few years, Target will likely be the next-most-dominant chain. Target previously said that it would convert a large number of existing Zellers retail stores to Target stores in 2013, and on Thursday it added two new locations: Niagara Falls, Ontario, and Laval, Quebec. The company paid $1.85 billion last year to acquire the leases of 189 Zellers stores, 39 of which it sold to Wal-Mart. Renovating the Zellers locations will allow Target to move more quickly than if it had to build new stores. Each of the existing retail stores will be closed for six to nine months for more than $10 million worth of renovation, the company said. Target said each store will employ 150 to 200 people, and that hiring of management personnel has begun. Hourly workers will be hired in late 2012 and early 2013. Target will open distribution centers in Calgary, Alberta; Cornwall, Ontario, and Milton, Ontario. Target operates 1,764 stores in the United States, plus the Target.com retail website. The list of the Canadian stores is at startribune.com/a1512. @SEAN, SEAN I HEARD ON CH 7 NEWS THIS MORNING THAT DAFFYS IS CLOSING ALL OF THEIR 19 STORES DUE TO BANKRUPTCY. RETAIL IS STILL SHAKY DAFFYS , JC PENNEY BEST BUY WHATS GOING TO HAPPEN AT THE END OF THE YEAR AFTER THE 2912 HOLIDAY SEASON. IF THINGS DO NOT GET BETTER SOON SHOPS AT NANUET WILL HAVE A TOUGH TIME GETTING STORES BETWEEN THE ECONOMY AND THUS AREA. I KNOW SOMEONE IN KOHLS THEIR SALES HAVENT BEEN TOO GOOD AS WELL. @rob, Yeah I saw the article on Daffy’s Yesterday. Look at the contrast between your last comment & the article I posted on Target above. What you will notice is that retailing in Canadian cities is thriving, while retailing here in the states is shaky in many locations. That’s why Bed Bath & Beyond, Best Buy, Target & several others have invaded or will invade the great white north in the near future. Canadians can officially say goodbye to the Zellers brand, as most of the 64 locations that aren’t being converted to Target department stores will close by March 2013. Some locations could reopen as part of other retail chains, Hudson’s Bay Company spokesperson Tiffany Bourré said. With an average of 100 employees per store, about 6,400 Zellers employees will lose their jobs. The locations were not considered viable, and were left out of Target’s acquisition of Zellers from HBC in 2011. There is no geographical trend to the closures, which are happening in communities from Kenora, Ont. to Winnipeg and Toronto. Ontario is the biggest victim, with 29 locations set to close, followed by Quebec with 15. “We’ve been reviewing our options for the brand since the completion of the acquisition agreement with Target,” Ms. Bourré said. Zellers, which offers everything from housewares to hoisery, has faced an onslaught of competition from large U.S. retailers in recent years, most notably from Walmart, which has been expanding into a one-stop destination with dry cleaning services and a full suite of groceries. Zellers was one of the last remaining large Canadian discount retailers after the Woolco, BiWay and Bargain Harold’s brands became extinct years ago. Uncertainty has been a recurring theme since the first acquisition announcement, said Kevin Shimmin, national representative for United Food and Commercial Workers Canada. His union represents workers at 15 Zellers locations across Canada, nine of which are keeping the Zellers brand until it folds in 2013. Stellarton, N.S.-based Crombie Real Estate Investment Trust is the landlord of seven Zellers outlets in the Maritimes. Three sites were not accepted in the Target deal; one of those locations has a year remaining on its lease with Zellers, but the other two have nine. HBC retains control of the sites and will decide what to do with them, Crombie chief Donald Clow said. “We will work with them to understand what their plans are,” Mr. Clow said. Target plans to open 125 to 135 stores in Canada. It has purchased the leasehold interests of 189 sites currently operated by Zellers Inc. and it says about $10-million to $11-million will be invested to remodel each facility. The U.S. retailer is poised to begin opening the first of between 125 and 135 stores in Canada at former Zellers locations acquired from Hudson’s Bay Co. The store openings are set to start next year. Zellers has been a key part of the Hudson Bay portfolio since 1978, emerging as the company’s discount retail subsidiary by offering clothing and household items at lower price points. It remained in the HBC fold as the company refocused its efforts on its core retail business in the 1980s and 1990s. 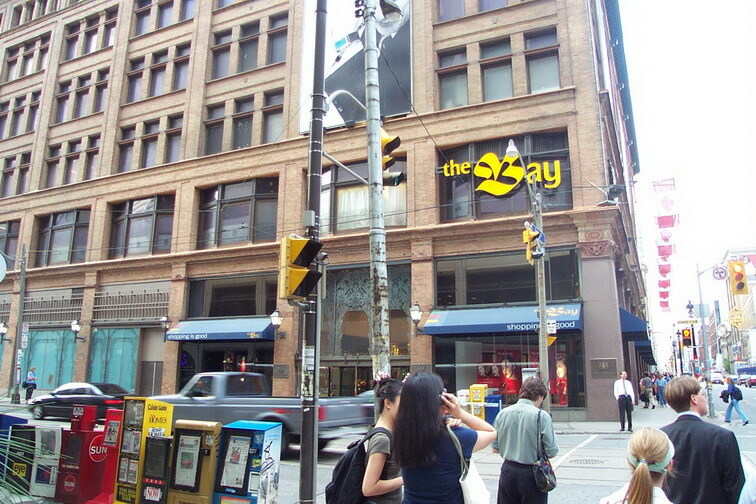 In recent years the company has made efforts to revitalize its The Bay stores, hiring former Holt Renfrew executive Bonnie Brooks as chief executive officer, introducing high-end boutique spaces in its Toronto flagship store and securing the rights to produce uniforms and merchandise for Canada’s Olympic athletes. The sale of Zellers stores to Target has been discussed since at least 2004, when Target was rumoured to be in talks with Hudson’s Bay Co. to buy its Zellers stores. @SEAN, Hey Sean havent seen you on in a while guess you were on vacation. I was at Palisades today Yardhouse opened its a big restaurant. i cant wait to try the food. JC PENNEY i heard may go back to coupons and sales its the only way they will regain their customer base especially when the holidays come this year. their sales are down 20 percent. @rob, I wasn’t on vacation, rather there wasn’t anything worth posting until the Zellers article above. There’s one more article regarding Bloomingdale’s that is tied to this one, but I cant get it to post for some reason. I’ll try again. I went to Monmouth Mall last week & I posted my thaughts on the renovation there. I too want to try Yardhouse & you are right that palisades location is huge! It’s got to be well over 10,000 square feet, but remember that there was Bravo, Cold Stone & a former Cheeburger Cheeburger in those spaces. U.S. luxury retailer Nordstrom Inc. sees potential to open more than a dozen of its lower-priced Rack shops in Canada, and will start rolling them out after it opens the first of its namesake department stores in the country in the fall of 2014. Nordstrom’s first international venture came up against a tight commercial real estate market in Canada. “There are few retail centers that warrant the kind of investment and the kind of store we have, and so there isn’t a plethora of choices,” he said in an interview. The company is one of a long list of U.S. retailers expanding into Canada, lured by a relatively resilient economy and customers who are often already familiar with U.S. brands. U.S. discount chain Target Corp is set to open 125 Canadian stores starting next spring, a move that is expected to shake up the market. Nordstrom will open in Calgary’s Chinook Centre in the fall of 2014, Ottawa’s Rideau Centre and Vancouver’s Pacific Centre in the spring of 2015 and Toronto’s Sherway Gardens in the fall of 2016. All four malls are operated by commercial real estate heavyweight Cadillac Fairview, owned by the Ontario Teachers’ Pension Plan. In Canada, Nordstrom will come up against closely held luxury department store chain Holt Renfrew. The move also comes as Hudson’s Bay Co. pushes to move its Canadian business upscale and eyes an initial public offering. The company’s flagship chain, The Bay, has been swapping out brands, pushing to improve customer service and hosting high-profile celebrity fashion events at remodeled downtown stores. HBC will feel pressure from Target at the low end, and at some locations, from Nordstrom at the high end, said Alex Arifuzzaman, partner at InterStratics Consultants Inc.
“They’re going to have to address that through marketing, through product, through pricing, and it’s going to be a challenge, but it’s not an insurmountable challenge,” he said. Blake Nordstrom said he is confident about finding space for his company’s smaller Rack outlets in the Canadian market. “I think in an ideal world we’d get a full-line store open, our first is Calgary, and then shortly thereafter start looking at Racks,” he said. He sees the potential for up to nine full Nordstrom stores and 12 to 15 Racks in Canada. In August, Nordstrom boosted its profit and sales forecasts for the year, helped by sales at the Rack chain, which it plans to expand dramatically in the next four years. It said it was aiming for 230 Rack stores by the end of 2016, up from 110. The company also plans to have offer a credit card in Canada, but the president said it is too early for specifics. Hudson’s Bay Co., Canada’s oldest company, will return to the Toronto Stock Exchange after more than six years as mass-retailer Target Corp. (TGT) and upscale department store Nordstrom Inc. arrive from the U.S. to challenge both the high and low-end of its market share. The 342-year-old retailer, which owns the U.S. fashion store chain Lord & Taylor and The Bay department stores in Canada, is pursuing an initial public offering after “executing a transformation” and “revitalization” of its stores, Hudson’s Bay said in a regulatory filing. The Toronto-based company didn’t disclose the amount to be raised or the share price. Hudson’s Bay, which dates back to 1670 when it was founded as a fur-trading venture, seeks to sell shares at a time when retail competition is poised to intensify in Canada. Minneapolis-based Target, the second-biggest U.S. retailer, plans to open 125 to 135 stores in the country next year, and Seattle-based Nordstrom (JWN) plans to open the first of what may be nine locations in 2014. Hudson’s Bay may seek to raise C$500 million ($511 million), two people with knowledge of the matter said on Sept. 5, who asked not to be identified as the process is confidential. Hudson’s Bay would probably sell 20 percent of itself, one person said. Hudson’s Bay said “over the long term” it plans to pay quarterly dividends with a target payout ratio of 20 percent to 25 percent of expected profit. Smedley, whose firm invests in consumer and discretionary stocks, said he’d consider investing in the retailer, which he noted has improved its offerings in the past couple years. “It’s in a very important sector for us and we obviously have to look at an issue like this,” Smedley, 74, said. The Bay has a “moderate” merchandise overlap and 40 percent of its stores will be within a kilometer (0.62 miles) of a Target and 72 percent within five kilometers, according to an Oct. 1 note from Barclays Plc analyst Jim Durran. Hudson’s Bay had C$3.9 billion of retail sales in fiscal 2011, according to the filing. That included C$2.2 billion of sales from stores under The Bay name, and C$1.4 billion of sales from the 48 Lord & Taylor stores, according to the filing. “The North American department store segment has benefited from a revitalization in recent years, resulting in improved sales and margin trends for us and many of our competitors,” the company said in its filing. Profit rose to C$1.45 billion for fiscal 2011, from C$88 million in 2010, according to the filing. In January 2011 Hudson’s Bay sold leases for up to 220 of its Zellers stores to Target for C$1.8 billion. Profit from continuing operations was $57.3 million in the period. The retailer posted a C$147.8 million loss for the 26 weeks ended July 28, according to the filing. Same-store sales rose 3.7 percent in 2011 and 3.2 percent in 2010, compared with 2.8 percent average growth among 10 major U.S. department stores last year and 2.9 percent growth in 2010, according to data compiled by Bloomberg. Most chains count locations open at least a year to tabulate same-store sales. The revenue is a key indicator of a retailer’s growth because new and closed sites are excluded. The store’s margin from earnings before interest, taxes, depreciation and amortization, a key measure of profitability, was 8 percent in 2011 compared to an average of 9 percent among 10 U.S. department stores, according to data compiled by Bloomberg. Hudson’s Bay was previously publicly traded in Canada until U.S. investor Jerry Zucker took the chain private in 2006 for C$860 million after fighting for control for more than a year. In 2008, NRDC Equity Partners LLC, owner of the Lord & Taylor and Fortunoff chains, agreed to acquire Hudson’s Bay, investing $500 million in new equity. NRDC Chief Executive Officer Richard Baker became CEO of Hudson’s Bay. In 2008 Baker hired Bonnie Brooks as president and put her in charge of The Bay after Brooks engineered the turnaround of Hong Kong-based department store Lane Crawford Joyce Group. Since 2008 Hudson’s Bay has invested in upgrading and modernizing its stores and replacing under-performing brands with stronger ones. Lord & Taylor, founded in 1826, became a unit of Hudson’s Bay in January. Today, the company operates 90 Hudson’s Bay department stores and 69 Home Outfitters housewares stores across Canada, as well as 48 Lord & Taylor stores in the U.S. The sale is being led by Royal Bank of Canada (RY), Bank of Montreal (BMO), Canadian Imperial Bank of Commerce and Bank of America Merrill Lynch, the company said in a statement. Great panaramic video of the mall. The first in a series of videos in the PATH network in downtown Toronto. There are over 1200 stores & restaurants in the various tunnels connecting hundreds of office towers, above ground malls like Eaton Center, the convention center & transpertation hubs like the coach terminal, Union Station & several subway stations. In the states, the closest aquivilant is http://www.crystalcityshops.com in Arlington VA near Washington DC. MINNEAPOLIS — Target Corp. here said Wednesday it expects to launch its entry into Canada in early April in the Greater Toronto area, with plans to open 124 stores across the country in five waves. Gregg W. Steinhafel, president and chief executive officer, said Target plans to open between 20 and 28 stores per cycle in April and May and every couple of months after that, starting in Toronto before moving to Western Canada and then shifting its efforts back to the eastern part of the country. Because the Zellers stores it acquired for its Canada entry are smaller than Targets in the U.S., the company has arranged to expand 40 locations to create more than 600,000 square feet of incremental selling space, John J. Mulligan, executive vice president and chief financial officer, said during a conference call with analysts. Target will invest between $10 million and $11 million per existing building in Canada, for a total capital investment this year of approximately $1.5 billion, Mulligan said. In addition, the company expects to spend about $2.3 billion in the U.S., with investments in supply chain and technology likely to be as high as investments in new stores and remodels, he noted. He said the company’s full-year comps should be around 2.7%, similar to the 2012 result; adjusted for the 53rd week this year, the company expects sales to grow about 2%, he added. Sears Canada has been closing some of its most prominent locations and reducing the number of employees in hopes that it can lower its expensesTORONTO – A new round of store closures by Sears Canada, which includes its flagship location in Toronto’s Eaton Centre, has raised questions about the company’s turnaround strategy and which American retailer will claim that coveted spot. Sears (TSX:SCC) said Tuesday it was selling the leases on five department stores, in a $400 million deal, which comes as the company pushes ahead with a broader effort to revamp its operations that will also see about 1,200 employees lose their jobs. The transactions amount to the biggest sale of leases since the company began to shed assets and cut jobs in an effort to revitalize its struggling operations amid intense competition. Under the agreements, store leases for Sears locations at Sherway Gardens in Toronto, the Markville Shopping Centre in Markham, Ont., London-Masonville Place in London, Ont. and Richmond Centre in Richmond, B.C. will also be sold back to mall operator Cadillac Fairview and its partners. Sears Canada says about 965 employees at its stores will be affected, though they will have the option to apply for other available jobs within the company. An outdated distribution centre owned by Sears will also be closed in Regina next year, affecting another 276 jobs, while the company plans to replace it with a new facility in Calgary that would support its online and catalogue business. The decision by Sears to exit the Eaton Centre is especially notable because it’s one of the company’s most visible Canadian stores, located in a central tourist area. The five-storey retail space is unique because shoppers entering the north end of the mall are forced to walk through the store to access most other stores. That design makes it especially appealing for retailers who want to increase traffic, but the massive square footage of the complex will be expensive and daunting to occupy for most companies. Some of Sears’ previously-divested locations have already been picked up by U.S. high-end retailer Nordstrom, which used them to launch its first stores in Canada. That has prompted speculation that Nordstrom may also be eyeing the Eaton Centre or Sherway stores, which are seen as prime real estate for retailers. Nordstrom would be the most obvious choice for that space, and a much better fit than Quebec-based Simons, another large retailer some have suggested could move into such a key spot, said John Crombie, senior managing director of national retail services at Cushman and Wakefield. “The American brands still like Canada, are interested in coming to Canada,” said Crombie. While Sears’ decision to give up some of its choice locations may be hard to understand, he added, it’s also important to consider that leases can be liabilities. When a tenant wants to get rid of such liabilities, they sometimes go to the best real estate first. The sell off has also prompted questions about the viability of Sears’ attempted turnaround, especially after Calvin McDonald, the retailer’s former CEO, abruptly resigned last month for a job at North American beauty giant Sephora. Evan Mann, senior analyst at New York-based Gimme Credit, said his firm remains “skeptical” on the long-term prospects for Sears Holdings. “This mornings’ announcement strikes us as a ‘sugar coated’ continuation of the struggling retailer’s orderly liquidation,” he said in a note to clients. Mann also pointed to the troubles that Sears Holdings Corp. is having in the United States, where it said Tuesday it would consider separating its Lands’ End and Sears Auto Center businesses from the rest of the company. Sears Holdings said it would likely pursue a spinoff of Lands’ End and not a sale. Despite the challenges in Canada, the sale of leases is part of Sears’ turnaround strategy, said Doug Campbell, who replaced McDonald as CEO. He said it doesn’t mean the company is moving away from urban markets or engaging in any kind of asset sell off. “I don’t have any strategy to sell stores, nor am I approaching anyone to try to sell stores,” Campbell said in an interview. Campbell said the company would do everything possible to mitigate the impact on those losing their jobs as a result of the changes, and reassured consumers that the company wasn’t going anywhere. “We continue to invest in the business and to be as relevant as we can to Canadian customers,” he said. Reaction on Twitter was mixed, with some lamenting the decline of what was once a retail giant and others looking forward to new shopping alternatives. “More bad news for #Sears. Retail Darwinism in action,” tweeted one user. “#Sears is closing #Toronto store because nobody btw (between) 14-40 yrs shops there,” said another. “I really hope @Nordstrom replaces #Sears in #LdnOnt Masonville Mall!,” another user said. Sears will leave most of the stores by Feb. 28, 2014, but will continue to operate its headquarters on the top four floors of its space in the Eaton Centre, where it opened in 2000. The stores in Markham and Richmond will be vacated before Feb. 28, 2015. After the latest round of lease sales, which are expected to close Nov. 12, Sears will have 111 department stores across the country. Sears Canada also recently sold leases for several prominent stores, including Toronto’s Yorkdale Shopping Centre and Square One Shopping Centre in Mississauga, Ont. Those were in addition to leases sold last year, including one at Vancouver’s Pacific Centre. On the Toronto Stock Exchange, Sears shares were trading up 81 cents, or nearly six per cent, at $14.35. In Canadian Retail, Will 2014 be Nordstrom’s Year? ReutersIf 2013 was the year of Target in Canadian retail, 2014 could be the year of Nordstrom. The Seattle-based, upscale department-store chain is set to open the first of several full-line Nordstrom Inc. stores in Canada next year, an arrival that’s already spurring changes among other high-end retailers. As was the case for Target Corp., which launched its Canadian expansion in 2013 with 124 stores across the country, expectations for the arrival of Nordstrom are high. An influx of purveyors of pricier goods has retailers in Canada sharpening their skills, and might well have other higher-end retailers giving the country a second look, analysts say. “There is gravitational pull in the market,” said David Ian Gray, retail strategist at Vancouver-based DIG360 Consulting Ltd. “And because of that, there’s going to be a focus on the higher end,” he said. Nordstrom, which has 117 stores across the U.S., is known within shopping circles for its customer service, shoe department and popular discount stores. “We’re bringing the full Nordstrom experience” to Canada, said Nordstrom spokesman John Bailey. Foreign retailers have been strategically setting up shop in Canada in recent years, lured by the relative health of the Canadian economy and the loosening purse strings of Canadian shoppers. Canada rebounded from the global recession more swiftly than most of its peers and averted the kind of housing crisis that drained wealth from consumers across much of the developed world. And in recent years, that’s helped draw higher-end retailers such as J.Crew, White House Black Market, Ann Taylor, Mulberry and Tory Burch north. Canada’s 340-year-old, upscale department-store chain — Hudson’s Bay Co. — appears to be hunkering down for Nordstrom’s arrival, expanding shoe departments in some locations and opening its first-ever The Bay Outlet store, in suburban Toronto. It’s broadening its assortment as well, lining up partnerships with New York’s Kleinfeld Bridal and the U.K.’s popular TopShop brand. The Canadian mainstay is also planning a major department store launch of its own. The company, which recently acquired Saks Inc., said it plans to bring as many as seven full-line Saks Fifth Avenue stores to Canada, and up to 25 of Saks’ smaller-footprint Off Fifth discount stores. Nordstrom plans to open five full-price department stores in Canada–with locations in Calgary, Ottawa, Vancouver, and two in Toronto. The Calgary store is slated to open first, in September, Mr. Bailey said. The others will follow in 2015 and 2016. The retailer is also scouting other Canadian locations, aiming to open at least eight full-line stores, and almost 20 of its discount Nordstrom Rack stores. 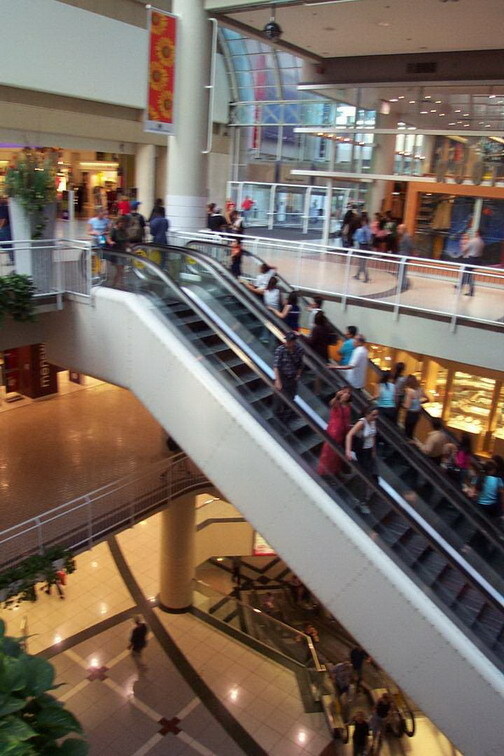 Canadians have been considered “significantly under-served” in retail, according to Vancouver-based Colliers International Consulting , with just 14.6 square feet of shopping center space per capita, compared to 23.8 square feet per capita in the U.S. That might be gradually changing, as Canada adds millions of square feet of leasable shopping space each year, the consultancy group said. But foreign retailers have been undeterred by the rising competition, in part because Canada’s shopping center productivity still far outpaces that in the U.S. In Canada, annual shopping center productivity is 605 Canadian dollars ($567) per square foot, compared to an average of $455 in the U.S., Colliers says. It wouldn’t shock me in the least if Nordstrom replaces Sears at Toronto’s Eton Center. If it does, that would be an upgrade of massive proportions. TORONTO (Reuters) – Hudson’s Bay Co (HBC said on Monday that it would sell its flagship downtown Toronto store and neighboring executive offices for C$650 million ($587.09 million) to Cadillac Fairview Corp and open a full-line Saks store in the leased-back space. The Canadian retailer, which completed its $2.4 billion purchase of U.S. luxury chain Saks Inc late last year, said it expects to open an approximately 150,000 square-foot, multi-level Saks in the fall of 2015, co-located with the current Hudson’s Bay store. Hudson’s Bay said it will use cash from the sale of its downtown Toronto retail complex and neighboring Simpson’s Tower to reduce debt and invest in growth initiatives. In a deal expected to close next year, Hudson’s Bay will lease the space back for 25 years, with renewal options for a term just under 50 years. Saks has also agreed to lease space for a full-line store in Toronto’s Sherway Gardens mall under the arrangement. “We continue to explore other options to create additional value through the power and potential of our real estate assets,” said Hudson’s Bay Chief Executive Officer Richard Baker in a statement. Hudson’s Bay, which traces its roots to the Canadian fur trade in the late 1600s, operates The Bay and Home Outfitters in Canada and Saks and Lord & Taylor in the United States. The announcement of Saks’ Canadian entry comes as rival Nordstrom Inc (JWN prepares to open its first store in Canada this year, setting the stage for a battle between two top U.S. luxury chains in the heart of the country’s most competitive retail market. Nordstrom recently said it would open a flagship store in Toronto’s downtown Eaton Center in 2016, in space soon to be freed up by Sears Canada Inc (SCC and just a stone’s throw from the planned Saks store on Toronto’s Yonge Street shopping strip. Target Corp.’s decision to exit the Canadian market leaves 133 stores dark, and experts say finding tenants to backfill the 15 million sq. ft. of vacant big-box space will be difficult. Triovest manages 4.6 million sq. ft. of retail space across Canada, primarily in power centers. They work on behalf of large institutional clients including pension funds. Currently, the firm has three Target stores in its portfolio, two in the Toronto area and one in Vancouver. “I think a lot of landlords are going to have to redevelop [the empty Target] space, perhaps even into new types of uses like office or medical,” Crombie says. Crombie expects Target’s exit to push retail vacancies up by 2.8 percent. “That is a significant lift—15 million sq. ft. is equivalent to two years of new development here,” he points out. Walmart, Costco, Canadian Tire and Loblaw are among the retailers that are the right size to take Target real estate. However, experts question what kind of interest the stores will generate. In an article published in the Harvard Business Review, Denise Dahlhoff, research director of the Baker Retailing Center at the Wharton School of the University of Pennsylvania, wrote that Target’s Canadian store locations were “often out of the way”. Dahlhoff said the stores “weren’t up to par with Target’s U.S. look” and struggled with distribution challenges and shelf replenishment. “Particularly for Canadians familiar with Target, the poorly stocked shelves, an assortment that differed from the U.S. stores’ and often higher prices than in the U.S. all combined to discourage traffic,” she wrote. Target’s cash costs to discontinue Canadian operations are expected to be $500 million to $600 million, most of which will occur in the company’s 2015 fiscal year or later. The company has sufficient resources to fund these expected costs, including cash on hand and ongoing cash generation by its U.S. business. Moore says Target’s exit is more about the retailer’s failed execution than the Canadian retail market. “The retail environment is a little tougher than it was 10 years ago, but retail sales are still positive,” he explains. Last year, Canada posted national retail sales growth of more than 4 percent, according to Colliers Canada. Canada’s “Big Four” (Ontario, Quebec, Alberta and BC in order of magnitude) generated a combined $275.46 billion in retail sales net of auto and gasoline, accounting for nearly 86 percent of the national total.